Rising star Matt Wallace makes his Players Championship debut on the Stadium Course at Sawgrass which starts on Thursday. 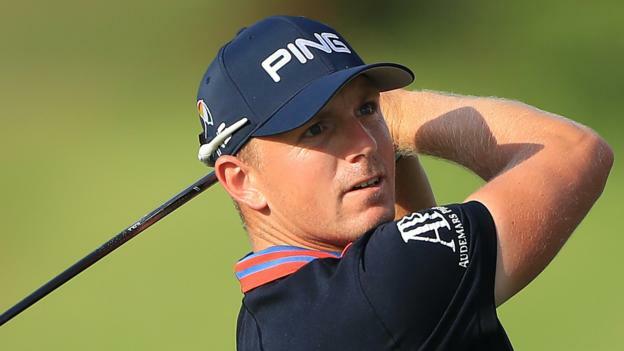 The 28-year-old Londoner, who finished sixth in the Arnold Palmer Invitational at Bay Hill last Sunday, is providing an exclusive Players diary for BBC Sport. This place is fantastic. It is a proper, proper golf course and already it has been a different experience. For example on the little island green 17th, it was the first time I’ve felt so intense in a practice round. I wasn’t really nervous but the intensity levels rose massively. Normally I’m not a very good practice-round player, I’m just trying to see everything and see the bad stuff and trying to plot my way round. But that tee shot was serious focus because people were watching and you do not want to mess it up. It was the first time I had such intensity before a tournament has actually started. I hit two shots; one to the right flag and then one to a front flag and both found the green so it was all fine. I’ve had a chat with Sir Nick Faldo early in the week and he has been brilliant. He’s been commentating on me and looking at my game. We did a little bit on putting and a bit on chipping and talking about some tournaments coming up – one particularly in April – you know the one, where he’s done particularly well! I’m getting messages from home saying how well I have taken to the PGA Tour and it has been great for them to be able to watch me at night rather than miss it during the day. We’ve got off to a great start in the United States. Getting the invite into the Honda Classic was so special, knowing the golf course so well off television and it was as hard as it looks. It makes my intensity levels rise because it is so tough out here. You have to drive it well, hit different types of iron shots to hold the greens and slow the ball down. That level of golf makes you better and that’s where my levels are at. I’m really enjoying it; I’m loving the crowds, I’m loving everything about the PGA Tour and this place is pretty special. It’s nice to be putting myself in these situations so early in the year. Finishing second in Dubai got the juices flowing and then coming out here onto a new tour for me. Some people might have wondered if I was ready for this but I wasn’t thinking that. I was just trying to play good golf and what comes with that is being in situations like last Sunday when I was in the thick of it on the final afternoon. I was a bit disappointed to miss that short putt on the last at Bay Hill but I always try to use setbacks to make myself better. So I went and saw putting coach Phil Kenyon yesterday. He teaches my coach Mike Kanski and if I hadn’t missed that putt on the last I would not have done that. Phil made me realise I had been aiming way left and there is a beauty in that because I only saw him because I missed that putt. Now my aim will be better and I feel more comfortable because of that missed putt. I listened to Justin Rose saying that this is anyone’s golf course. The best player will win which is so good for me coming into events like this. If I play the golf that I know I can, then I know I will have a chance. It’s literally play good golf and see where you rank against the best players in the world. I went to university over here so I’m acclimatised to how to play but the way my golf has changed it just adds to how you play over here. You have to hit fairways and greens and chip and putt well. That was especially the case at Bay Hill last week where the rough was so thick. I think that’s why you saw so many Europeans at the top of the leaderboard. This is not the first time I have competed here. I did the Jacksonville University tournament in 2011 but the grass was dormant and so brown it was crazy. So it was different and I was not a very good golfer then. I will be playing the course a little bit differently this week. It is a lot softer and at this time of year the wind gets up. In practice it has been brutal at times. On Tuesday I asked my caddie Dave McNeilly what would be a good score and he said anything around level par in those blustery conditions. I have an early start on Thursday and it will be nice to get out there and post a score and see where that puts me. One thing that tells me I’m doing ok over here is that I’ve been followed back by the PGA Tour on Twitter! I was happy about that. Matt Wallace was speaking to BBC golf correspondent Ian Carter.